Arriving On the 18th of November we bid farewell to our home in Tallevana to Annie and to our wonderful volunteers Ilias and Leonora. With heavy bags and excited hearts we set out on our three day journey across Europe. Our adventure went something like this: Ytterjarna-Sodetalije-Copenhagen-Hamburg-Amsterdam-Newcastle-Aberdeen-Forres-Findhorn. I remember gazing out of the window on one of the many trains we took and contemplating how different it is to travel by land, how we were moving more in tune with time and how that made me realise the distance and how huge our beautiful planet is. I noticed the merging of landscapes and of culture into one another. Arriving in scotland we were greeted by the rolling ultramarine sea, rocky emerald islands and sandy dunes. The air smelled fresh, the sky shifted from sun to rain in a matter of minutes and then a rainbow arching gracefully across the azure heavens. When we arrived in Forres we were welcomed by smiling faces and Findhorn Foundation buses. We piled into the two buses. Our regular hyper chit chat had grown faint tired from the days of travelling. We drove along windy country roads in the dark, curious for what would reveal itself in the morning. 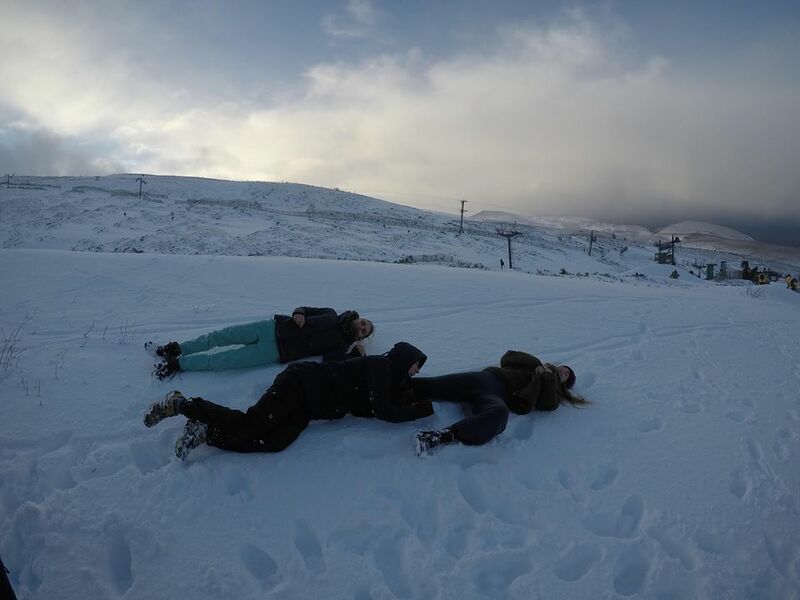 For the first week we slept in the Findhorn Village Hostel in dorm rooms of ten, a quick cosy bunching together before separating into six different houses. After a long sleep we woke up to the strong sea breeze and many of us walked along the bay that arches around the edge of the town greeting the morning with an exquisite view of a glimmering ocean adorable families of seals and a beach full of talking pieces. We could never have expected such a warm and inviting welcome from the community from day one we felt at ease and that our presence was really appreciated. Here we are spending our days and nights under the scottish sky. Walking across a land that holds many tales and stories from time gone by and together, collectively we are learning. Sketches, notes and recordings of process and learning that came from confronting ourselves, our relationships and our own dynamics as a group. This week we faced discomfort, friction, tears, laughter, release and movement within the group as we explored group dynamics using the ‘container principle’. 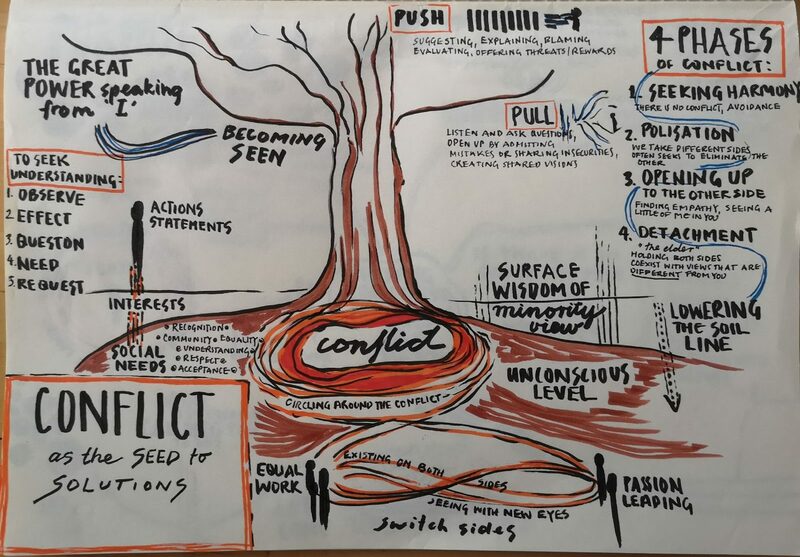 This means the conflicts and complexity in the group were surfaced and addressed as a way to practically understand and experience the processes, tools and frameworks of working together through difference. For me this was the first time we really faced and named some of the underlying challenges, feelings and patterns our group holds and from bravely confronting what lay beneath the surface we were able to find movement through friction. The course was facilitated by Zaid (Social Labs Revolution), with the assistance of Kaospilots student Alexandra and Morton. The process they led us through was a practical example of some processes used in the work they do with Social Labs where they bring people together across difference to solve complex social problems like climate change, homelessness and poverty. Like many courses in YIP, this course had us look inwards to then look outwards. It shows us how often our own challenges mirror the challenges of the world. In order to to move forward we must face one another, grow in our discomfort and embrace friction in order to commit to a third space of shared creation. We’re not quite there yet, but we’re working on it. Over the weekend we each became acquainted with a mysterious, bubbly character about whom we had heard a-lot of stories. He was arriving to host our next course, ‘Community Challenge Week’ which began on Monday morning with a joyful introduction to a traditional dance lead by Nil Noguera, YIP 6 alumni and community friend. Next we caught our breath whilst he gave us an introduction to the process of Oasis Game, before we took our fika (now at Findhorn simply referred to as ‘Break’). We left the room with the instructions that we should be back and wait outside the room for a perfectly on time surprise starting at 11am…When we burst through the doors thirty minutes later we encountered an empty room with Mission Impossible music playing and an umbrella hanging from the ceiling with numbered rolled pages dangling from each edge! Once unrolled, with a fluttering of confetti, our group challenge was revealed; 1) To host an Oasis Game inspired process to gather wisdom from the Findhorn community to surface all the zero waste initiatives, dreams and problems, 2) To offer our time to every initiative 3) Create a proposal for a zero waste ’30 Day Challenge’ that we could invite them to join us in undertaking in the New Year. Our deadline, Thursday night, when we were to host a celebration with the community, presenting all we had learnt and signing people into our ’30 Day Challenge’ (at least 15 community members and 15 Yippies had to sign up, in order for us to pass the challenge!). Well, after much experimenting, challenges and an immense growth in group trust, we passed our challenge and had a wonderful celebration with the community. Nil’s effervescent music had everyone dancing by the end, and it rings through my memories of this week. He left us that weekend, though only for a short while, as he will be back to join us as an OT when we return to Jarna from our internships in April. Throughout this week our group dynamic evolved, we realised that we can create spectacular things in very little time, from nothing, if we each work to our strengths and trust each-other. Moving forwards, I feel the group is taking an awakened enthusiasm and energy towards action, which is filtering into our Initiative Forum planning. Let’s see where it takes us! Exciting News ! Initiative Forum tickets will go on sale in January 2019. We having been working hard on bringing initiative forum to you for another year and we are really looking forward to sharing our discoveries and experiences together with you. If you are interested in seeing some behind the scenes of how we are working as a group check out our instagram page, initiative forum 2019. We are looking forward to gathering together again on January 6th. We wish everyone happy holidays and a cheerful winter solstice. 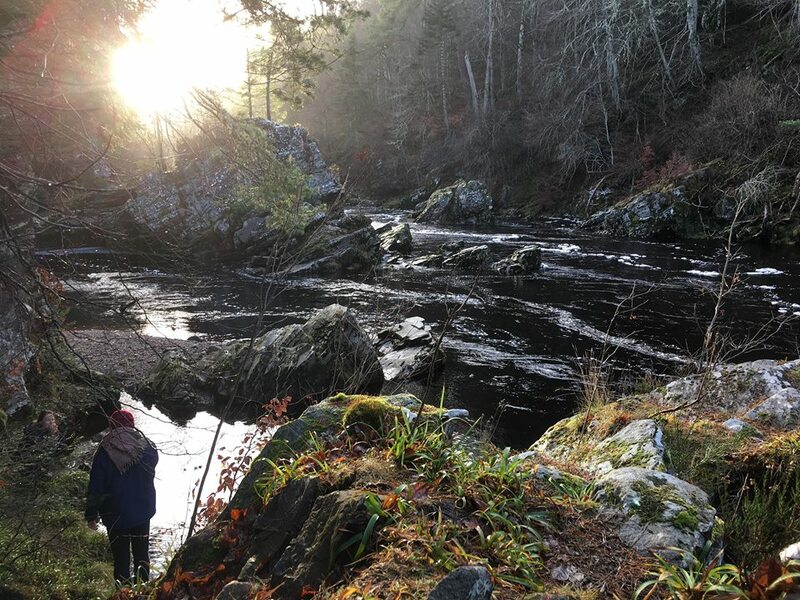 In our next newsletter we will share more reflections about Findhorn, the permaculture design course (PDC) and update you on internships and initiative forum.